In the present work a DNA biosensor was used for the determination of the toxicity of different kinds of common surfactants. 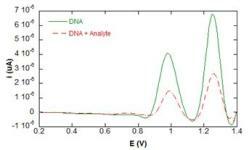 The intensity of the guanine oxidation peak, measured through Square Wave Voltammetry, usually quantifies the interactions between DNA and the eventually genotoxic substances. All surfactants caused a decrease of the guanine peak, in particular the nonionic surfactants were highly toxic followed by the moderately toxic anionic surfactants and cationic surfactants. Selected surfactants were investigated both in sea water and tap water, and data compared to those obtained in acetate buffer. In several cases it was observed that toxicity decreases with increasing concentration as a consequence of surfactant self-assembly. Indeed, the self-assembly process competes with the interaction with DNA. Hence the toxicity can qualitatively be related with the self-assembly behavior of the different surfactants in the different media.